If you don't have the time, patience, or confidence to build your own DIY hydroponic grow system, there are other options available on the market just for you. Ready-made hydroponic kits are a fast-growing niche. Check out our hydroponic systems reviews to figure out which one suits your needs the best. The Aerostar is a complete aeroponics system from Platinium, sans the grow lights. The 40x90 series model is capable of housing ten individual plants in separate grow pots. The unit is made from black recyclable plastic. The ABS material used in its constructions looks quite rigid and durable. It may not get any marks for its looks, but that is not a significant factor anyway. The important thing is that it has everything you need to kick-start your very own aeroponics system from the get-go. The design also gets plus points for some thoughtful touches. Minor things like detachable hatches, easy access ports, and universal interchangeable parts make the Aerostar deceptively easy to use. For a complex system armed with tubing and 360-degree sprayers for ten plants, that is no small feat. And they have also managed contain everything in a very compact and space saving format as well. The grow pots are each generously sized at around 3.6L capacity each. This is enough to accommodate the high growth rates you can expect from an aeroponics system. Overall, the Aerostar is well-rounded aeroponics system. It is very flexible and easy to set up and maintain. One area where Aeroponic techniques fare much better than hydroponics is in cloning of plants for wider cultivation. Cuttings from your mother plant will have a much better chance of successful propagation in an aeroponic cloning machine. Clone King has several aeroponic machines specifically for the propagation of high volume of saplings. The particular model reviewed here has 36 separate sites for individual plants. The system uses 13 spray heads to deliver the water and nutrients in mist form to the root area of the clones. This is a complete system, requiring minimal setup and assembly. It does not include any grow lights as usual. This particular version of the CloneKing does not have net pots. Instead, it uses neoprene inserts to hold the plants in place. If you want a system with net pots, you should check out the CloneKing 25 machine. The neoprene inserts are reusable, and you can continuously use this cloning machine to create clones of your favorite plants for your garden or hydroponics system. CloneKing is a very popular option for both experts and beginners alike due to its overall efficiency and accessibility. It also has a very compact footprint. The PowerGrow DWC system uses large 5-gallon buckets for their deepwater system. The buckets are made from FDA-rated food storage plastics. The system contains eight individual buckets, each capable of growing one plant to full maturity. The buckets are all connected to a central air pump using separate air lines. The PowerGrow system tries to distinguish itself from the competition by adding air stones to each bucket. These stones further oxygenate the water, in addition to the oxygen pumped in by the industrial air pump. The system is complete and requires only grow lights to start nurturing your plants. The bucket lids contain large 6-inch net cups capable of housing fully mature vegetable and fruit plants. Assembly and maintenance of the PowerGrow system are largely hassle-free. The buckets are armed with water level indicators and drains, which make reservoir refills and cleaning easier. Due to the simple and scalable design, you can easily expand this system by adding more buckets. Space is obviously the limiting factor here, due to the size of individual 8-gallon buckets. The Bubble Brothers is a slightly smaller DWC system from HTG Supply. Its overall design is quite similar to the other system from PowerGrow. This one has a slightly smaller profile, with six individual grow sites, housed inside opaque plastic buckets. The buckets are smaller, at 3.5-gallon capacity, and have a lower profile. The system includes an air pump that is connected to the six buckets using separate air lines and a six-way divider. The air lines use ¼" tubing. The lids of the buckets contain 6" net pots capable of growing plants to full maturity. You will need a growing medium, and HTG Supply has got you covered with clay pebbles (10L bag worth). The opaque surfaces and lids on buckets deter the growth of algae. And the presence of large 2" air stones inside the reservoir ensures that the nutrient solution is adequately oxygenated. The system is easy to assemble and maintain. This is a practical option for beginners and growers who want a quick-assembly DWC hydroponics system. The WaterFarm module is an interesting choice for beginners looking at a compact drip hydroponics system. It has a very small footprint and can be housed pretty much anywhere. Despite its diminutive size (15x10x7 inches), this is an entirely autonomous standalone unit. It requires minimal assembly, and you can start growing your plant within a matter of minutes. 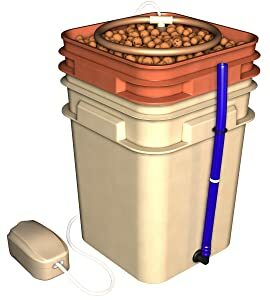 The central unit is a four-gallon square plastic bucket, with a two gallon growing chamber inside. The system uses a built-in pumping column drip ring to handle the watering of your plant. Each module can house a single plant. A complete system would include the bucket, drip pump, air pump, growing medium (hydroton pebbles), nutrients, and water level indicator. There are two options from General Hydroponics when it comes to components included in the package. The WaterFarm system is the complete package, while the module has only the bucket, growing chamber, and pumping column drip ring. The module is a good choice if you want to string together multiple grow sites into a single sophisticated system. Or you can even hook each one up separately as this design gives you that freedom. The module is for seasoned growers who want to configure their own drip system. If you are a beginner, look for the WaterFarm Individual, or WaterFarm 8-pack from the same manufacturer. The EcoGrower opts for a design philosophy that is the opposite of the modular system found in the WaterFarm series from General Hydroponics. Here, you get a single structure that has multiple grow sites integrated into it. The hexagonal structure has six grow sites, built into the lid inserts that sit on top of the reservoir. And to provide enough water to six growing plants, you need a pretty large reservoir. The EcoGrower reservoir is up to that task, with a maximum capacity of 17 gallons. The nutrients are delivered to the individual grow sites using a spider drip system. This is an air-driven system, powered by an Elite 800 air pump. The lid inserts have 6" net pots, each capable of growing a plant to full maturity. General Hydroponics provides clay pebbles as part of the package. The EcoGrower is a complete system, with a reservoir, drip assembly system, air pump, lid inserts, liners, air pump, growing medium and nutrients all included in the package. You only need to add the seedlings, water, power and grow lights. The system has very few moving parts and is easy to install. The large reservoir will need frequent maintenance though. The EcoGrower is a good option for folks who wanted to upgrade from smaller beginner hydroponics systems. This is a very flexible and efficient ebb and flow system from Active Aqua. The base variant has 12 individual pots, but you can expand it all the way to 48 pots if necessary. The system uses a small reservoir and controller unit to run the system. The controller unit is capable of running up to 48 pots. You can set the fill and drain cycles in the programmable controller and let it handle the rest. This autonomous unit has fail-safe systems, with overflow protection and LED indicators, and emergency shut off valve. The modular nature allows you to expand the Grow Flow system as you please. Active Aqua sells expansion packages that include anywhere from 6-12 extra growing modules. The package is pretty comprehensive and includes everything you need to get started, including the modules, fittings, tubing, controller, and reservoir. You even get small 1 quart bottles of nutrient systems. The reservoir has between 10-20 gallons capacity. Unlike the highly scalable Active Aqua system, the Via Grow is a more static structure available in several size options. These models can house anywhere from 9-25 nursery pots. Each ViaGrow system has a tray with 5.25" pots inside. The reservoir is housed beneath this tray. The system has a built-in programmable timer to control the flow cycles. The smallest model is very compact at 2x2 feet. Other options include 2x4, 3x3, and 4x4 variants, each with a higher number of nursery pots. The reservoir has a max capacity of 20 gallons on the smallest model. ViaGrow also sells grow lights and nutrient packages separately. The ViaGrow Complete is a very affordable ebb & flow system for beginners looking to get their hands on a full-size hydroponic system. It is easy to install and maintain. Thanks for reading our best hydroponic system reviews. We hope this article has given you enough information and knowledge about choosing the top ready-made hydroponic products on the market.